Q: Do different cats need different amounts of wet food? Dr. Leslie: The volume of food a cat needs to eat depends on how many calories are in its food and the energy demands of the cat. Pregnant, nursing, growing and high activity cats often need more calories than neutered or sedentary house cats. Geriatric and cats with chronic disease may have a difficult time maintaining their weight and may benefit from increased calories. Q: Can I find the amount I should feed my cat on the package? Dr. Leslie: Every bag or can of food has a section that recommends how much to feed. These calculations are based on the average need for a large population of cats. It is well documented that an individual cat may need up to 50 percent more or less than what is considered average. It is crucial to tailor the amount of food to help your cat achieve or maintain an ideal, lean body weight. Q: How frequently should I feed my cat? Dr. Leslie: How often food is offered can be divided into as many small meals as is convenient. Left to their own abilities, cats will eat up to 10 small meals a day — which is not often convenient for most pet parents. Some cats may have a preexisting condition, such as diabetes, that requires a more ridgid eating schedule. If your cat has a special condition, it is strongly advised to work with your veterinarian to help understand when, how much and how often to feed your cat. Q: How much food do growing cats need? Dr. Leslie: Growing cats may need up to three times the daily calories of adult cats. Make sure the food is formulated for 'Growth' or 'All Life Stages' to ensure it not only provides added calories needed for growth, but also contains the higher concentration of essential nutrients required for healthy growth. Q: Should I feed wet food at every meal? Dr. Leslie: No matter what you feed your cat, make sure it's complete and balanced. Cats who eat more canned food drink less water and cats who eat more dry food drink more water. Any combination of canned and dry food can be nutritionally sound as long as fresh water is available. Q: If my cat doesn't eat an entire can in one sitting, how long is it safe to leave out? Dr. Leslie: Since the canning process is the preservation method, opening a can starts the clock on the food spoiling. If a cat doesn't eat her portion within an hour, it should be securely covered and refrigerated up to four days, and then whatever is not consumed during that time should be discarded. Stale food may cause aversions to food, making cats not want to try it again. Q: If I refrigerate it, my cat sometimes will not eat it during the second feeding. Would she eat it if I stored it in a different container? Dr. Leslie: Try using a can-size specific lid to prevent drying. A better option might be to purchase a smaller size can that your cat can eat in one feeding, eliminating leftovers altogether. Q: Do you have any other tricks for getting my cat to eat leftover wet food? Dr. Leslie: A food aversion is difficult to reverse. In general, cats like food that has similar moisture and temperature to typical prey. They like wet food that is warmer; warming the food to room temperature or just above is one way to help cats enjoy their food. Be careful not to overheat the food as it could burn a cat's mouth or throat. 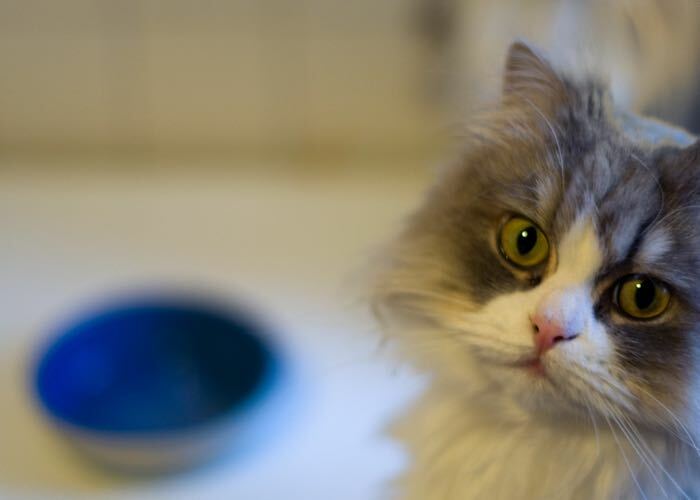 Does your cat love trying new wet food? Try Meow Mix® Classic Paté with Real Tuna to give her plenty of variety all in one recipe! Photo Credit 1: "Camilla" by yomo 13 via Flickr. License info. Photo Credit 2: "Hungry" by Christian Scheja via Flickr. License info.